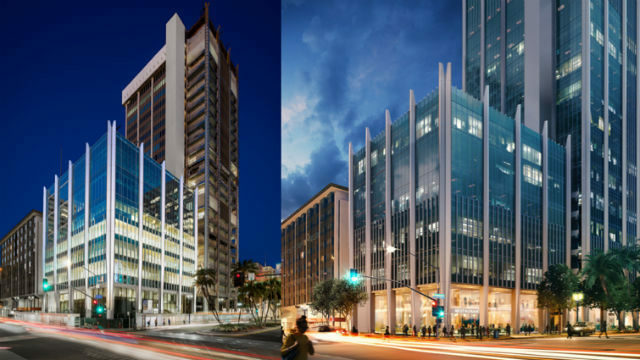 A 25-story modernist office tower opened in 1963 is getting a major modernization and facelift that will emphasize views of San Diego Bay and the Pacific Ocean. Tower 180° at 1st Avenue and Broadway will reopen later this summer with 360,000 square feet of office space. The “elemental modernism” design features 25-foot floor-to-ceiling glass windows and an expansive rooftop event space. The exterior of the tower’s eight-story annex is complete, and work has begun on the modernist lobby and exterior of the main tower. The tower was purchased for $55 million. The value of the renovation was not released, but is described as substantial. Since 2000, San Diego-based Hammer Ventures has developed over 3,000 multifamily units and over 1 million square feet of commercial space valued at a combined $2 billion.